What makes it soooo unique is that it's actually more of a STAMP than a brush on lip tint! Can't believe it/understand how it works!? Read on! First off, I love the packaging. It is just. so. cute. It reminds me of those chops I used to buy as a little kid, you know the kind where you twist the cap off and stamp (what I presume most commonly is) cartoon characters all over the place!? Truly creative product design! They get a 10 for that. The instead is a stamp, as you can see in the first/topmost photo, which is in the shape of lips! And whilst it may seem inconvenient, it actually isn't! I remember looking at it and thinking, wouldn't it be much easier if it was like a small circle or something so the accuracy would be improved? Well, I was wrong. The cupids bow at the middle of the lip actually does form to fit your own, and it does do a good job at the overall application as well! Now here's the "but" section.... 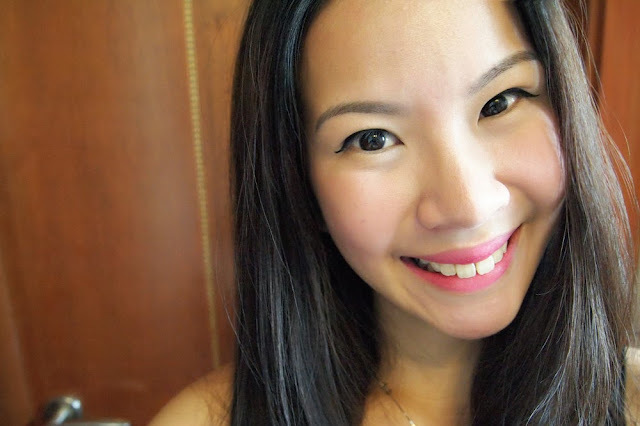 I hate to admit it but I do not like the chunkiness of the lip tint! :( It is not very easy to place in a makeup pouch, especially mine because mine is rather flat like a small purse. I suppose some others won't have an issue with this, but I do like to take my lip products out, so the fact that this doesn't fulfill that category does disappoint me a little. The whole idea is to dab the sponge onto the balm and then spread it onto your lips. A little like tinned lip balms except you do not use your fingers. I normally dab it in about 2-3 times and "stamp" it onto my lips. If I want a stronger color I just dab it in the pan a few more times and repeat the application. For more precision, I try to line up the cupids bow on the lip stamp as close to mind as possible! The texture inside reminds me a little of gel eyeliners... it looks like balm based than liquid. I suppose it is supposed to be creamy but I find it a little bit drying sometimes. Whilst it does go on smoothly, it CAN sometimes enter those fine lines in your lips when it dries - but that also depends on how often you exfoliate and take care of your lips. There are three colors available for this range: Red, Orange and Pink, but obviously I chose the pink one. This is because I already have quite a few reds and also have a favorite-and-can-never-be-replaced orange/coral (Dior's Riviera). This pink was also a little more baby-pink, unlike the brights I own. 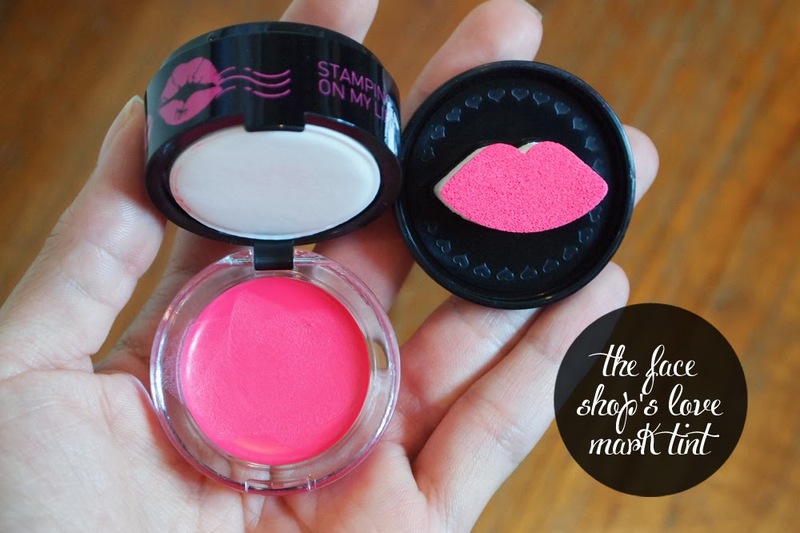 The color is easily buildable and can be layered to create a bolder lip. 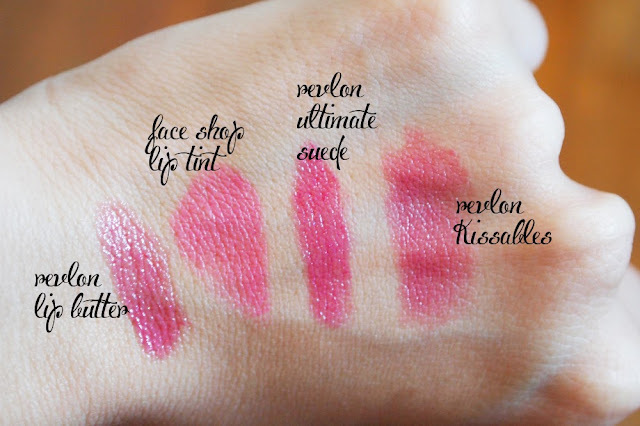 The pink reminds me of a cross between these few lip colors: Revlon's Kissables in Honey Dulce, Revlon's Lip Butters in Berry Smoothie, and Revlon's Ultimate Suede in Preview (Wow! That's a lot of Revlon!) I swatched them above so you can see what I mean. This lasts about 1-3 hours in a day, and when it faded, it faded quite evenly! What won me over was the fact that the color transfer was so little. I actually dabbed my lips (after allowing the lip tint to dry for about 20 minutes) and a lot less came off than if I used a lipstick! But to be honest, I cannot decide just how to judge the lasting power because it does seem to adhere well on some days but other days it looks terrible (meaning it dries up real badly and creates some lipliner look). To me that's already a kind of B- in my book because it's just not reliable enough. I actually wrote a post for this already, one night when I had applied this for testing and went for dinner. I ate appetizers, drank soup, ate rice, etc, and when I looked in the mirror after dinner, my lips were still flushed a very pretty shade of pink! It faded so evenly and naturally. I immediately came home, wrote a post on how amazing it was, and decided to test it again. Now, after about 5-10 tries, this is my true verdict. I like this but not enough. When I saw how dry it made my lips look, I was just horrified. From far I looked all pretty in pink but up close I had the shock of my life! Granted, that was about 3 hours after, but I just did not think it should've been that bad. Perhaps it's due to me not having very smooth,hydrated lips, but nothing really was as bad as this. To be fair, Ashley does exfoliate her lips and this works fine on her. So I'm going to assume it's just me. Perhaps it's not a bad product but just not for me. No. I don't think I need to explain. Stockists: any of The Face Shops around you! I bought mine at AMK Hub, but Singapore really has so many everywhere.